The third set of betas since their introduction at WWDC 2018, code for the new builds can be acquired from the Apple Developer Center, or for devices enrolled into the testing program, as over-the-air updates. Apple issued its first public betas for iOS 12 and tvOS 12 on Monday, then the first public beta for macOS Mojave on Tuesday. The third beta of iOS 12 has build number 16A5318d, up from the second beta's build 16A5308e. Apple is intending to make iOS 12 more useful for users of older iOS devices, with a focus on improving performance for existing iPads and iPhones. 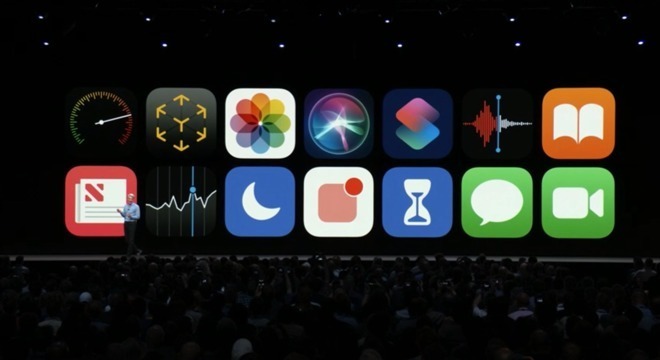 Digital health is also a focus point in iOS 12, with new tools including Screen Time allowing users to monitor their app usage, and to reduce their dependency on specific apps. Changes have been made to stock apps, including News, Weather, Stocks, and Voice Memos, while a new stock app called Measure will use ARKit to measure the dimensions of objects in 3D space. Owners of the iPad can expect iPhone X-inspired gestures and notification grouping, while third-party map support in CarPlay, Siri Shortcuts, Group FaceTime, and MeMoji are also included in the release. The third tvOS 12 beta replaces the second beta's build number 16J5303e. Dolby Atmos surround sound forma a major part of tvOS 12, which can be used to locate sounds in 3D space without relying on discrete channels. More home control systems will link their remotes to the Apple TV and include Siri support, while cross-device Autofill will bring passwords for tvOS apps from iOS equivalents. More TV services will be using the Apple TV as an alternative to the cable box, with Charter Spectrum set to do so later this year, along with France's Canal+ and Switzerland's Salt. Also, the Single Sign-On will be turned into "Zero Sign-On," where the provider's network is detected and the Apple TV will automatically sign the user into the necessary channel apps. Fans of the Aerial screensaver stand to benefit from extra details about pictured locations, summoned with a swipe and a tap, as well as a new Aerial view called "Earth" filmed from the International Space Station. New to watchOS 5 is the Walkie Talkie app, which can be used to perform push-to-talk communications between contacts, while each wears an Apple Watch. Pushing the button immediately opens the line of communication, and plays out what the transmitting user is saying via the receiving Apple Watch's speaker. Third-party apps can be added to the Siri watch face, including those from Nike. There's also no longer a need to say "Hey Siri" to trigger the assistant, as it can be called upon with a raise of the wrist instead. For activities, there are seven-day activity competitions that can be performed against contacts, with progress updates and awards available. Specific workouts are allowed, including hiking, yoga, and 12 other activities, as well as outdoor runs with pace alerts. The Apple Watch also includes automatic workout detection, and stress detection if the device determines the user has stopped. The milestone releases of the operating systems are not the only versions currently undergoing beta testing. Developer betas for iOS 11.4.1, macOS 10.13.6, tvOS 11.4.1, and watchOS 4.3.2 are being tested before release, with the stability and performance releases almost certain to be released this summer. Update: At present, the developer beta of Mojave is not currently available.